Discovering China from the North to the South by train! Visit China from the north to the south ! 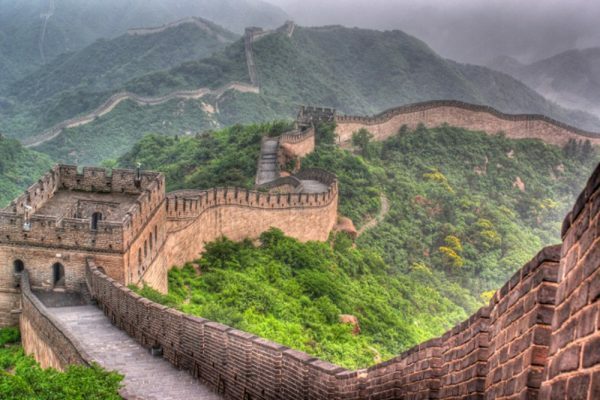 This tour takes only fast trains to travel through China, from Shanghai to Guangzhou, visiting the capital, Beijing, and the Chinese Wall, the old city of Pingyao before discovering the ancient Chinese capital Xi’an. Then, you will continue this train journey in China to the center of the country to discover the sights of the Longmen Caves and Shaolin Monastery, before going to Guilin to discover a rural China around the karst landscapes of Yangshuo, and ricefields around Ping’an. After that, taking the train for the last time to finish this China trip to Canton. With the train, a quick but effective trip! Discover a nice train tour through China. You will not borrow domestic flights but only fast trains. You will be able to visit the most important destinations of the country during a first trip in China. Arrival at Shanghai Airport (China). Welcome by your driver. 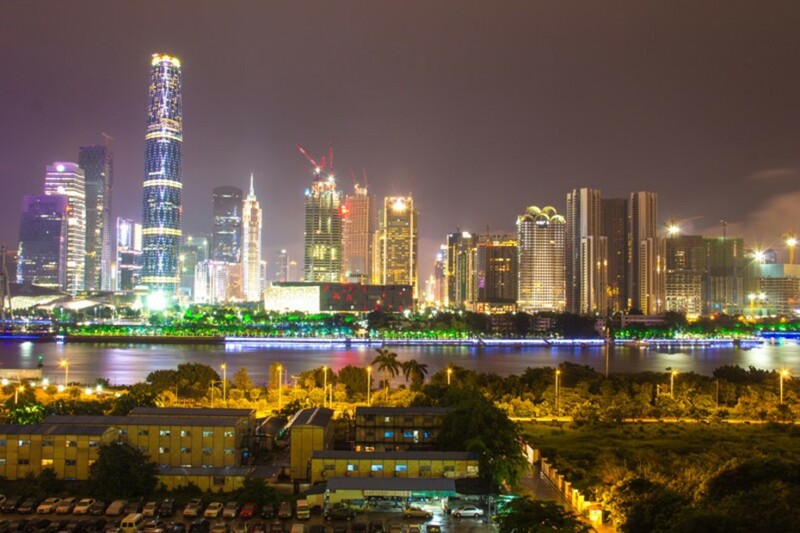 Private transfer to your hotel and free time for a first visit of Shanghai. Overnight at Holiday Inn Express Putuo Island. Visit (without guide or driver) of this fascinating metropolis of Shanghai, also known as the Paris of the Orient. Every corner of this city is different! Do not miss Jardin Yu, the French Concession, the most exclusive district of Shanghai. 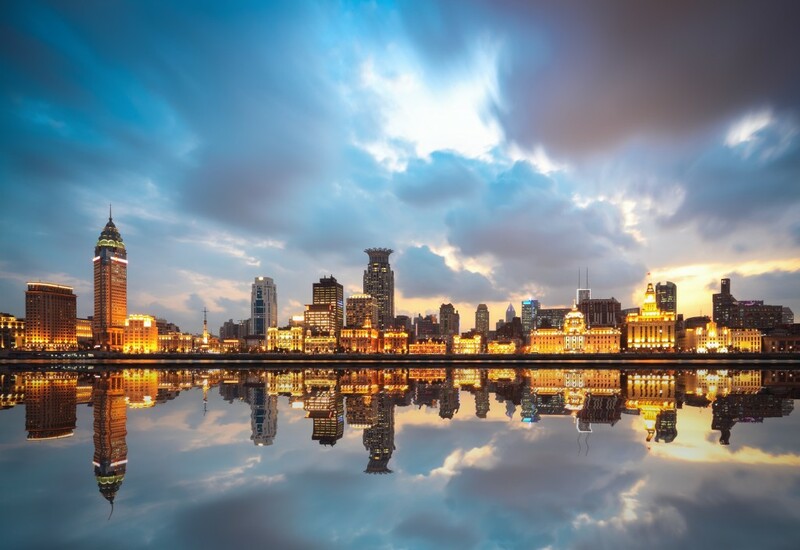 Stroll along the Huangpu River on the famous Bund. An almost surrealistic view with the story on one side and the future on the other. Climb into one of the tall towers on Pudong. There is something for everyone in Shanghai. In addition, with its 550 kilometers of metro, travel is easy! Free morning (without guide or driver) to visit for example the Jade Buddha Temple and the Shanghai Museum in People’s Square and extend to Nanjing Road, the largest shopping street in Shanghai. In the late afternoon, transfer to the station to take the TGV high speed train to Beijing (G20 16:00 – 21:17). Arrival at Beijing Railway Station. Welcome by your driver. Private transfer to your charming hotel designed in the style of traditional Beijing Hutong houses with a small inner courtyard. Accommodation at Kelly’s Courtyard Boutique Hotel. Free day (without guide or driver) to visit Beijing. Start early to discover the local life and the magnificent Temple of Heaven, nestled in the huge by Tiantan Gongyuan, whose majestic triple-roofed rotunda is one of the most beautiful achievements of Ming architecture. In the morning, hundreds of people practice Tai-ji, dance, singing … Continue to Tiananmen Square and the Forbidden City, once home to the Chinese emperors and center of political power. 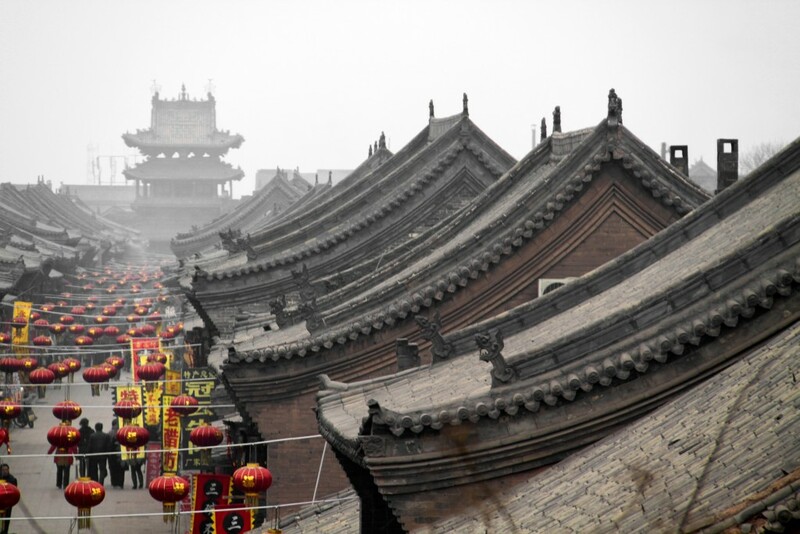 It is the largest and best preserved architectural ensemble in China. At the exit, go up the coal hill, from where you can enjoy a 360 degree view of Beijing. This morning, a driver (no guide) takes you to the Great Wall of China Jinshanling, built during the Ming Dynasty. One of the quietest and most exceptional sections of this Great Wall. On the way back, the driver drives you to the summer palace outside Beijing, as well as to its big Kunming Lake. 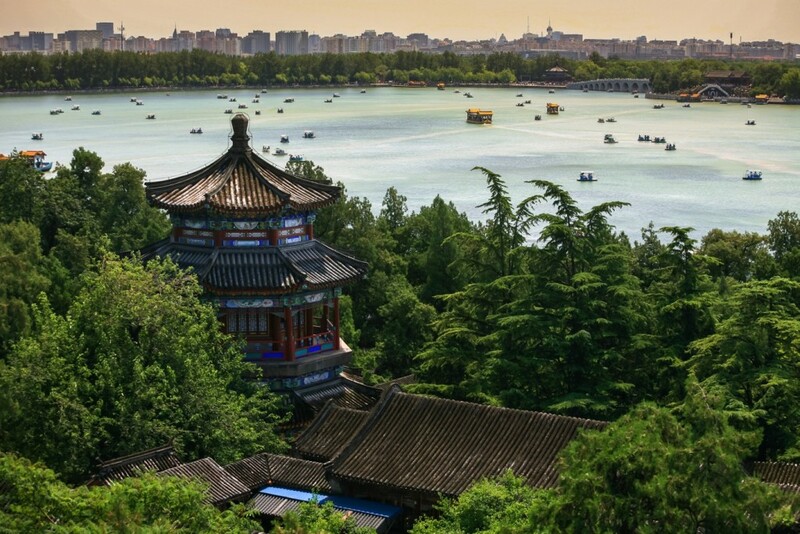 You can go for a boat ride on the pond in the huge park of Empress Cixi. Or just enjoy this huge park and its buildings inspired by the luxury tastes of the Empress. Last hours in Beijing to visit some more sites according to your wishes. In the early afternoon, transfer to Beijing Railway Station to take the high speed train to Pingyao (D2005 15:29 – 19:42). Arrive in Pingyao, and transfer to Dejuyuan Guest House. Free discovery (without guide or driver) of the old city of Pingyao through the Ming Street and Qing. Pingyao is an old financial town, easy to visit on foot. Entry to the sites is included in the quote. In the evening, transfer to the train station for the train TGV to Xi’An (D2529 20:00 – 22:40). In Xi’an, transfer to your hotel, the 7 Sages. Departure with driver and French speaking guide for the famous site of the army in terracotta supposed to protect the tomb of the first emperor of China, Qin Shi Huangdi. Reminiscent discovery of 6,000 warriors and clay horses, life-size, aligned in battle formation. Return to the city center via the Great Wild Goose Pagoda. Free day (without guide or driver) to walk in the Muslim neighborhood inhabited by the Hui community. Visit the mosque and Gaofu’s house. You can then climb and take a walk on the ramparts of 14KM. Possibility to rent bikes on site and discover the different towers in passing. The west tower is dedicated to the Silk Road. Early departure for Xi’An station to take the TGV train to Luoyang (G2002 07:42 – 09:17). Welcome by your guide and driver. 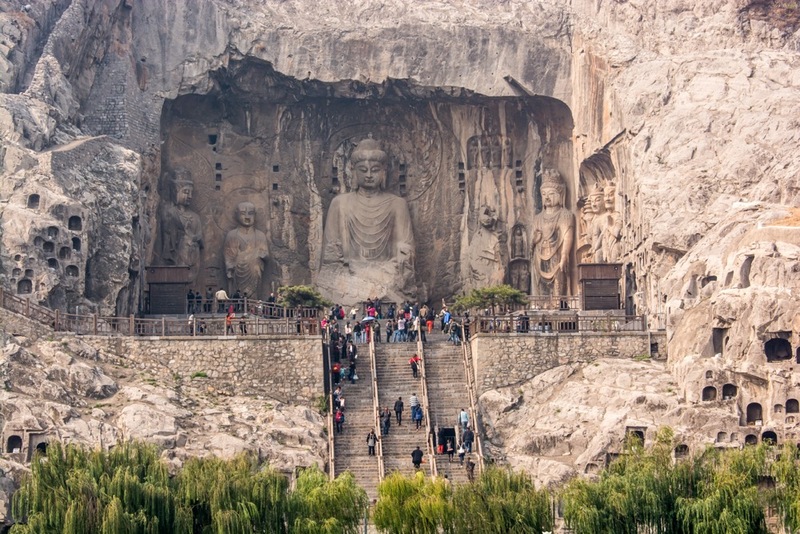 Visit the Longmen Caves, a huge complex of caves in honor of Buddha. 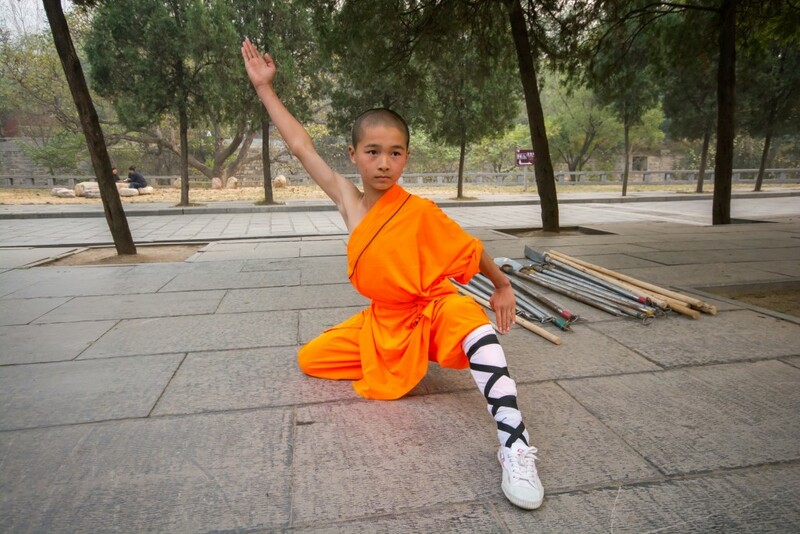 Continue to Shaolin Monastery. This monastery is best known for practicing Kung Fu and other martial arts. Transfer to your hotel in Zhengzhou City. Accommodation at the Holiday Inn Express. Early departure to take the TGV train to Guilin (G425 07:48 – 15:12). 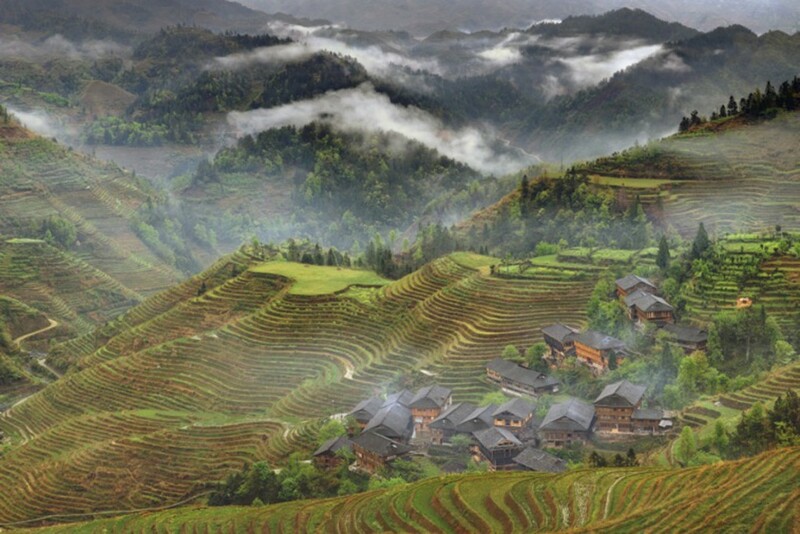 Welcome to Guilin by your French-speaking guide and private vehicle and drive to the region of rice terraces Longji, north of Guilin, gathered around the village of Dazhai and Ping’an. Arrival below the village of Ping’an, which you will reach on foot after 30 minutes of walk. This village of Zhuang ethnic group, is located in a beautiful setting of rice terraces, probably the most impressive in the region. Go up at the top of the rice fields for a superb point of view. Accommodation in Ping’an in a wooden inn, the Ping An Hotel. Free morning to walk along the rice fields. Then drive to the charming village of Yangshuo. En route you visit Xianggong shan Hill, a beautiful view of the most beautiful karst landscapes of China. Check into the Village Retreat Hotel, in the countryside, but only a 20-minute walk from the center of Yangshuo. End of the guide service. In the evening, enjoy the sound and light show “Liu San Jie”, based on a very popular Chinese musical, directed by Chinese filmmaker Zhang Yimou (director of the opening ceremony of the Beijing Olympic Games). 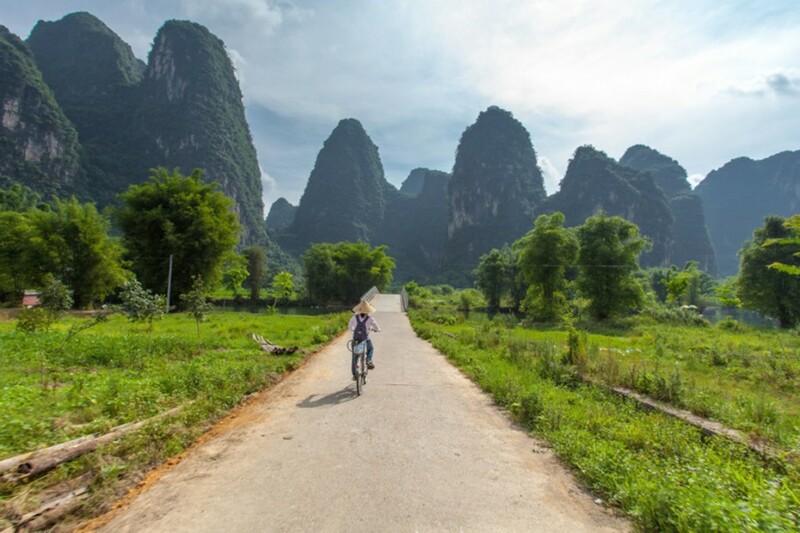 It takes place on the Li River in a beautiful natural setting surrounded by karst mountains). Enjoy the Yangshuo countryside. You can rent bicycles to discover the landscapes and the still very rural life of this region. 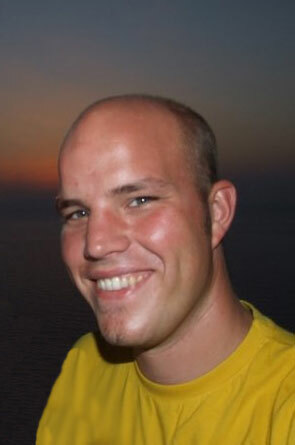 The hotel will help you with plans and some tips for visiting the area. Free morning, and then transfer to Yangshuo station to take the high-speed train to Canton (2h30 TGV). In Canton, your driver drives you to the hotel. Accommodation at Jianli Harmony Hotel.